Do you always feel exhausted during the day despite how much you sleep? Does your partner constantly complain about your loud snoring? Do you have problems remembering things or staying focused despite your best efforts? If so, then you could be suffering from sleep apnea, the second most common sleep disorder in the world. Left untreated, it cannot only rob you of your sleep but your long-term health as well. Thankfully, Dr. Stansbury is able to provide a safe and proven treatment that can fit right in your pocket. Why Choose Stansbury Dental Sleep Apnea Therapy? Sleep apnea is a condition where a person experiences short and frequent lapses in breathing while they sleep. This is most often caused by the soft tissues in the mouth and throat relaxing too much and blocking the airway. This forces the body to partially wake up in order to restore the flow of oxygen, preventing a person from getting the deep, restful sleep they need. This lack of oxygen is also extremely taxing on the body, causing the blood pressure to skyrocket and remain high even during a person’s waking hours. 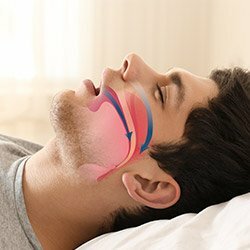 The most popular treatment for sleep apnea is CPAP therapy, where a patient literally straps on a mask connected to an air pump that forces oxygen into the throat in order to keep the airway open. As you can imagine, many patients find this very uncomfortable! This is why Dr. Stansbury is happy to offer a less invasive alternative: oral appliance therapy. With this approach, all a patient has to do is wear a custom-made oral appliance to bed. 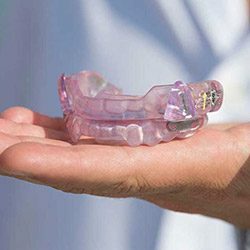 It will slightly shift the lower jaw forward, and this helps keep the airway open and prevent apnea symptoms, enabling a patient to breathe normally throughout the night and wake up feeling refreshed. These appliances are small, easy to use, create no noise, and have been shown to improve the sleep quality of 90% of the people who use them consistently. How Do I Get an Oral Appliance? You first need to have a diagnosis of sleep apnea from your doctor. If you have yet to be diagnosed, just give us a call, and we’ll help you take the necessary steps to do so. If you’re ready to finally get the quality of sleep you deserve, Dr. Stansbury is ready to help you do it. 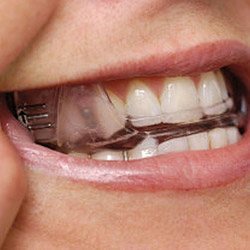 To learn more about oral appliance therapy and what it can do for you, contact us today.